Do you need to block out the sunlight? Blackout blinds for your VELUX windows are the answer! These high-quality blackout blinds perfectly darken any room at any time of the day. The blinds prevent light from coming in and also improves insulation. With a VELUX blackout blind, you can not only darken your living rooms with ease, but you can also avoid losing heat through the window in the winter and thereby improve the energy balance of your house. Browse below the window blinds we stock. We are able to get hold of other blinds from VELUX . 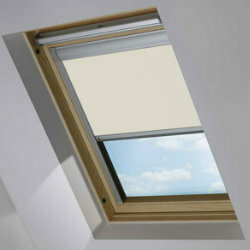 We also stock VELUX windows, flashings and installation products. Please get in touch on 01629 828500 if you have any questions.